I am glad of it and rejoice with all of you. 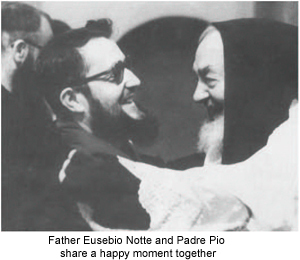 Father Eusebio Notte was Padre Pio’s assistant from 1960 to 1965.When Padre Pio was growing old and as his body became increasingly weaker, Father Eusebio was one of the few friars who had the privilege of caring for him. Like St. John with Our Lord, Father Eusebio was the disciple that Padre Pio loved. Father Eusebio could coax Padre Pio to take better care of himself. He could joke him out of his bouts of weariness and day and night he was always available, always there. “How can I express my experiences of five years in a few words. I was very, very close to Padre Pio. I took care of his room and his person. Before coming to San Giovanni Rotondo, I didn’t believe in him. My scepticism was not about his stigmata but about his sanctity. At that time he was under restrictions and many people were against him. I didn’t know whom to believe. I had to see for myself who Padre Pio was. I had been in England. When I returned to Italy, Father Provincial sent me to San Giovanni Rotondo. When I came to San Giovanni Rotundo, I tried to see if it was true or not that he was really a holy man. It was not difficult for me to acquire an experience of what he was, especially in his prayer life and the times he read people’s minds, and in the way he would answer the people’s questions. Now, afterwards, I believe in everything. I am convinced that Padre Pio was an extraordinary man, really a holy man. I did see the stigmata many, many times. I would be directly in front of him, and I could see his wounds very clearly. Many times I saw his hands bleeding through his gloves. Sometimes I found the sheets of his bed covered with blood, and at those times he was compelled to renew his bandages twice a day, especially the bandage on the wound of his heart. I must tell you something about the wound of his heart. One day Padre Pio fell down. He had been pushed by the devil. When we found him, he was covered with blood. I was there and I saw him. There was a woman in San Giovanni Rotundo who was possessed by the devil. The devil spoke through her and said that he himself had pushed Padre Pio down. The doctor was called to treat Padre Pio. I was the only priest who helped Padre Pio to change his undershirt on that occasion. It was then that I saw the wound on his side. It was an open wound. I saw the photographs of his body that were taken immediately after his death. First in one picture, you could see the wound of his side. In another photograph it was smaller. In another, smaller. And in another—nothing! All of the wounds of the stigmata disappeared after his death. My favorite reflection about Padre Pio is about how he lived his life. This means more to me than the miracles he performed. Miracles are found in the lives of all the saints. But if you had lived with Padre Pio from early in the morning till late at night, you would see for yourself the kind of life he lived. He would get up very early in the morning, clean his wounds and start to say the rosary and pray and meditate. Afterwards, Mass. After that, he stayed for many hours and heard Confessions. People would go to him not only for Confession but with every kind of question you could imagine; should I enter the hospital, should I have an operation, should I leave this job and take another? He always had presence of mind to give each person an answer. After hearing Confessions, he would go upstairs. Along the stairs and along the corridor were people after him with more questions, always after him for something. He never said,”Please let me think about it.” No! Bing, bing, bing. He had the answer. God was with Padre Pio all the time, to help him not to make mistakes. I have seen that. Another thing,the same question made by different people sometimes got a different answer. This is very important. It means that something that was good for you might not be good for another person. When he ate, his food was very, very, poor. He would eat a piece of macaroni and a tiny piece of fish. That was all the food he would have for the entire day. Humanly speaking he had no other source of nourishment. When he finally went to bed, he used to break his sleep to pray the rosary and say ejaculations. He got up very early in the morning at one o’clock a.m. or at two o’clock a.m. How much he prayed! The way he said Mass! The way he stayed with us! He would tell us stories and at the end he would have a good word to convince us to be better in our spiritual life. He was a man who put the theology of the cross in a special way; why you have to suffer to help God, because God wants you to help Him to bring souls to Him. God is a Father who sees value in our suffering. It is difficult for us to express this theology.